Sarutobi Shinobi Apparel: Kote is a Arm Guards in Nioh. "Gauntlets made of leather scales and thin iron plates that wrap around the arm, providing protection from the biceps to the hand. 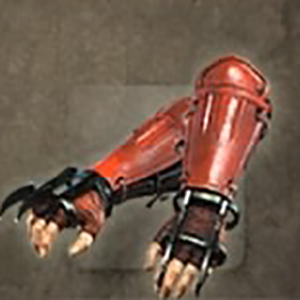 Sharp grappling claws are attached to the back of the hand , allowing wearer to jump at walls and ceilings to quickly evade detection. This apparel was worn by Sarutobi Sasuke, a ninja who served Sanada Yukimura. The nickname "Sarutobi" means "jumping monkey," and is given to exceptionally agile ninja. Sasuke was said to be so skilled in acrobatics that people called him "Sarutobi" until it practically became his surname. He served Yukimura from his time in Ueda of Shinano province (present-day Nagano prefecture, for whom he performed acts of espionage and disrupted enemy movements. During the winter Siege of Osaka, Sasuke slipped out of a secret tunnel under the cover of darkness and prevented enemy forces from storming the Sanada Maru."